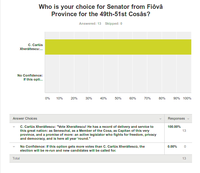 Fiôvâ's Senatorial elections are run by the Provincial SoS, i.e. me. I am not running again for Fiôvâ Senator (a FreeDems candidate will be announced shortly), so I need to know at this point if anyone has any objections to me running the Senatorial election, which will be a secret ballot via BallotBin. If there are no objections, nominations for Senator will open on January 2, when I get back from holiday, as described in Title III of the Fiovan Elections and Referendums Law. I nominate C. Carlüs Xheraltescù. I humbly accept the nomination, with thanks! Okay, nominations have been open for seven days, and it'sonly Carlüs so far. However, the Cosâ election has been delayed for a month. So I am minded - given my power under III.2 - to extend the "open period for nominations for Senator" for one month, until February 9. Any comments? Just to encourage people to jump in, I've made the call that I am going to release any new nominations as they come in, without waiting for the 9th. So far, it's only Carlüs. If for any reason you have not received this email, please tell me IMMEDIATELY. Your ballots will be sent to you only by email, to this same email address. Thank you. Audrada Rôibeardét, your email bounced! Please send me a new one via PM or you will not be able to participate in the Senatorial election. OKAY. The Senatorial ballot has gone out to everyone I had a current valid email address for. If you have not received your Senatorial election ballot yet, something has gone wrong, so tell me immediately. Note that you cannot actually vote until midnight Talossan time, which is, I believe, just over 9 hours from now. Fiôvâ Senatorial election open now. Go nuts. Aargh. Whom should I inform because of changed contact informations? The "eispetz" domain doesn't exist any longer, that's certainly why I didn't get an election notification on the national level. Sent you a new ballot at the other email I had for you. I told MPF about your changed contact info but often he doesn't "hear" things. Election results will be released on the dot of midnight Talossan time. Turnout is currently 13/25. That's, er, pretty conclusive. Well done, C. Carlüs Xheraltescù ! Therefore in accordance with the Fiôvân Elections and Referendums Act III.5, I hereby announce that by a majority of 13-0 with no recorded abstentions, C. Carlüs Xheraltescù is the Senator from Fiôvâ Province for the terms of the 49th, 50th and 51st Cosâs. I'd like to offer my sincerest thanks to everyone who voted for me; I hope I can do this province proud in the coming term and I vow to tirelessly protect the freedoms and privacy of each citizen until the fight is eventually over. Stay classy, Fiova!